Thank you for your interest in the TASIS Summer Programs in Switzerland. Please submit this form if you have questions about our programs or would like to set up a campus visit. A representative from our Admissions Office will be in contact with you shortly. The magic begins on our campus, which is perched on a hillside in sunny southern Switzerland with commanding views of snow-capped mountains, palm trees, and Lake Lugano. Our travel program will introduce you to other majestic natural settings—from the Swiss Alps to the Italian lakes to the Mediterranean coast. Most mornings are dedicated to traditional classroom learning with a rst-rate team of dedicated educators. Take intensive courses in Italian, French, or English; prepare for the IB Diploma Program; develop your own lean startup; and study robotics, science, graphic design, digital photography, architecture & design, fashion & textile design, or musical theater. We have made our natural and cultural setting in the heart of Europe our classroom since 1956. Explore stunning Swiss and Italian cities while you study architecture and design in Weil-Am- Rhein, learn from fashion experts in Milan, capture photographs in Como, hone your cooking skills in Luino, visit the Swiss Museum of Transport in Lucerne, and so much more. 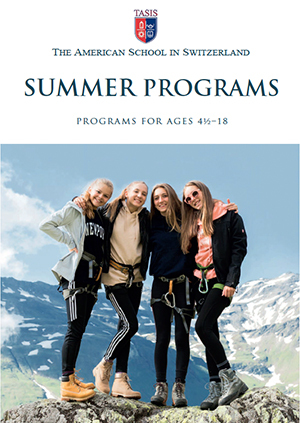 There is no shortage of adventure opportunities at the TASIS Summer Programs. Whatever you wish to try—be it whitewater rafting, canyoning, kayaking, canoeing, waterskiing, windsurfing, sailing, paddleboarding, rock climbing, glacier hiking, ice climbing, zip-lining, or riding an alpine slide—we have you covered. You will hone your existing talents and discover new ones. Whether you want to star in an original musical, learn a new instrument, perform a modern dance, write your own script or song, paint a canvas of the campus, take the perfect photo, design a poster, create an architecture model, or design a clothing line, our devoted team of visual and performing arts professionals will help you achieve your goal. Join a vibrant global community of students who represent more than 60 nations and form friendships that will last a lifetime. The TASIS experience unlocks the unique potential of every student and produces what our founder, M. Crist Fleming, called "international human beings—men and women who are capable of moving easily in any society and any civilization on the face of the earth."